The parts I marked with horizontal bars are affected by the "swing rule" and played as 2/12+1/12 instead of 3/16+1/16. 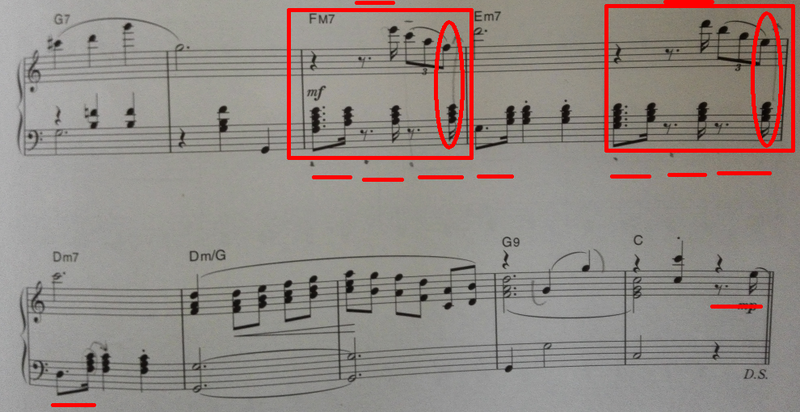 The notes I circled are played at exactly the same time. What is the real, correct name of this "swing rule" (so we can Google it)? Does the actual physical position of the notes on the sheet matter? Somebody said that there is a slight delay in the original soundtrack (something like 1/32-1/64 which I didn't really hear) and it is also visible in the notes sheet because the 1/16 note is slightly shifted to the right relative to the third triplet note. Yes, it applies to any combination of notes and rests. •What is the real, correct name of this "swing rule" (so we can Google it)? No idea, but this notation has been commonly used in classical music for centuries before Jazz was "invented." Back in the 18th century, nobody bothered to write the explicit instruction - it was just considered to be "musical common sense" and it avoided writing "quarter + eighth-note" triplets. Often, triplets were not explicitly marked with a "3". Note, in a slow tempo in classical music, the 1/16 note may be shortened to 1/6 of a quarter note, not lengthened to 1/3. For example the first movement of Beethoven's "Moonlight sonata" is usually played that way. •Does the actual physical position of the notes on the sheet matter? Somebody said that there is a slight delay in the original soundtrack (something like 1/32-1/64 which I didn't really hear) and it is also visible in the notes sheet because the 1/16 note is slightly shifted to the right relative to the third triplet note. A professional music engraver would probably make the 1/16 note line up with the third note of the triplet. But most recently-published music is created using notation software that doesn't do that sort of thing by default, and used by people who just assume the computer will do everything right. 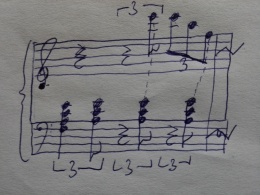 If the score is played by a notation program, that will also ignore the timing adjustment, unless somebody adjusts the timing of the 16th notes by hand. In a quick tempo, it's hard to hear the difference anyway. This is more an instruction to a human player not to try to separate the last note of the triplet and the 16th note. Yes. To be pedantic, they are not supposed to be obviously different lengths - humans hardly ever play music in absolutely strict tempo. Your interpretation is correct. The triplets would not change the general swing feel with the 16th notes. It is just a notational convention. There are important points here, worthy of Answer status. If the composer really wants triplets, he should write triplets, or use 12/8 time. If he wants Swing, he should write straight 8s and indicate "Swing". Computer playback is absolutely TERRIBLE at interpreting Swing! The notation of this excerpt is sloppy and inconsistent. A computer will make a mess of it, if interpreted literally (as has been demonstrated). But, strangely enough, a live player would have little difficulty in interpreting it and giving a stylish performance. Is there a way to notate alternative transitions between 2 sections of music?